Win up to $1,000 CASH instantly! 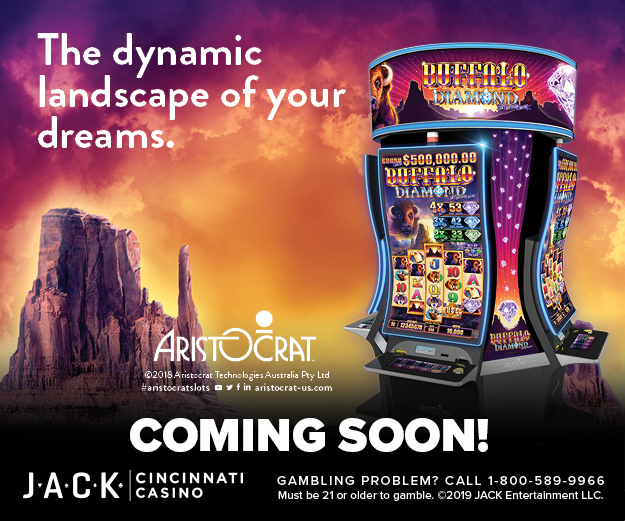 Look for the JACK Instant Cash signs on select slot machines! The dynamic landscape of your dreams. Stars align in a galactic halo and volcanos erupt with electrified excitement. Luminous stars reward credit prizes, progressive wins and bonus prizes, which may award wheel spins of a greater magnitude! Action Stacked Symbols appear on all reels. Glittering treasures and golden rewards await those who feel the beat of Dancing Drums TM , the vibrant new 5-Reel, Asian-themed video slot featuring the Fu Babies. Bier Haus™ is sudsy fun with a chance to win up to 80 Free Games with Locked Wilds! Order up from everyone's favorite beer maiden, Heidi, and enjoy! Players spin for 6 or more scattered symbols and are granted 3 initial free spins for a chance to win some big awards. Upon trigger, all positions with the scattered symbol are held in place and all other reel positions spin again as independent reels. Each added scattered symbol awards an additional prize to the player and continues the free spins bonus. The fun continues until no more free spins remain or the Grand Jackpot is won! Brilliant, colorful, Asian-based themes, Lightning Link™ inspiration on steroids that uses a common orb trigger symbol across all game themes for uniformity. LOCK IT LINK - Triggered by any combination of 3-5 Heart or Gold Heart symbols on a row, grants 3-5 spins. The Heart symbols that triggered the Lock it Link feature will be group together with a border, and locked in place. LOCK IT LINK – Triggered by any combination of 3-5 Heart or Gold Heart symbols on a row, grants 3-5 spins. The Heart symbols that triggered the Lock it Link feature will be group together with a border, and locked in place. Throughout the 3-5 spins each Heart symbol landed will remain on the reel until all Heart symbols can be linked together, or until the 3-5 free spins have come to an end. Each heart symbol the player lands on will restart the Free 3-5 spins. At the end of the feature, the value on all the Hearts Lock and Link collected is awarded. If all 15 positions are covered by the Heart or Gold Heart symbols, the value on each feature symbol increases by an additional 2x total bet. The Ultimate Fire Link® series showcases fast-paced, progressive games that gives players a heart-pounding slot experience. Choose to play Game 1, Games 1-2, Games 1-3 or Games 1-4. Choose your bet multiplier. All wins are multiplied by the bet multiplier. Bonus reels are in play when playing Games 1-4. Buffalo™, 5 Dragons™, Pompeii™ & Wicked Winnings™ II. Scatter Wins and Bonus Prizes are added to REEL POWER™ or XTRA REEL POWER™ wins. No need to call the fire department – it’s just Jackpot Inferno™ 30 burning up the casino floor with its sizzling 5-Reel, 50-Line action for players who want to feel the heat! No need to call the fire department – it’s just Jackpot Inferno™ 30 burning up the casino floor with its sizzling 5-Reel, 50-Line action for players who want to feel the heat! The Free Spin Bonus ignites when 3, 4, or 5 Bonus symbols land scattered. Players will feel the burn when 5 – 10 Jackpot Inferno symbols land scattered on the reels, triggering the Jackpot Jump™ and a chance to win a progressive jackpot. The temperature will rise, and so will players’ winnings, on Jackpot Inferno!